If NPCM Wigneswaran and TNA members want to help Jaffna famers there is an unusual book that they should read. The principal author of this book of collection of essays, “Community based water conservation and development: two contrasting examples from Sri Lanka and from Russia” (OPRO Printers, Moratuwa, Sri Lanka, September 2013) is the well-known engineer D.L.O. Mendis. With names and dates, he alleges, that the River for Jaffna project was derailed half-way from its completion by two or three non-engineers holding high-level positions in GOSL, just by exchanging a few e-mails between them! Despite this arbitrary act, a technical committee which had the task of prioritizing the water resource development projects to be undertaken in the island listed River for Jaffna as the new number one priority. Therefore, instead of promoting Tamil separatism by way of planting maaveerar trees or using the word genocide, Wigneswaran can help Jaffna people by getting the RfJ project resurrected ASAP. DLOM’s book gives all the information he needs to request, if necessary, funding help from David Cameron, Manmohan Singh or the Canadian one, via MahindaR. The concept of River for Jaffna is therefore nothing but using the Vetiya idea kind of water conservation method to raise the groundwater level in the Jaffna Peninsula. If some modern “environmentalist” is worried about its environmental impact, the only adverse impact will be the need to change from fishing in brackish water lagoon to fishing in a fresh water lagoon. It is like tobacco framers are offered subsidy to change over to onion or chilly cultivation! Transition from brackish water to freshwater lakes will take time giving room for fishermen to adjust to the change. The River for Jaffna does not mean creating a new river, overland concrete canal or a huge pipeline. The idea of converting several lagoons is the Jaffna peninsula into fresh water lakes is at least a century old. At present there are over 100,000 water wells in Jaffna and the top part of these wells hold fresh water. If well water is pumped out excessively then salt water underneath comes out and spoils cultivation. So the purpose of RfJ is to saturate the groundwater with fresh water lagoons and thus keep the salt water down. This can one day help in protecting these wells from the adverse effects of a possible sea-level rise due to global warming. 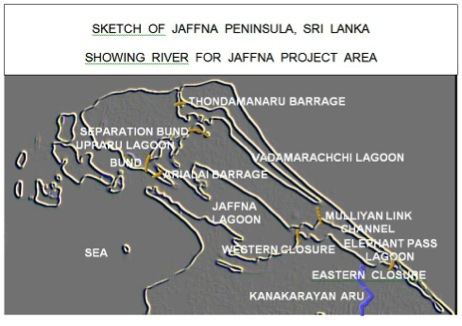 The RfJ is simply a plan to augment the freshwater groundwater supply in the Jaffna peninsula by a erecting a few barrages so that the water coming from the Kanakarayan Aru and three smaller streams to the Elephant Pass Lagoon is taken to the Vadamarachchi Lagoon through Muliyan Link Channel. The project consists of five barrages, one bund and a link channel. While RfJ is half completed and it is evaluated as the number one priority by a recent expert committee a different more costly project is being promoted by the National Water Supply and Drainage Board with an ADB loan. This new project plans to take water from the Iranamadu tank to the city of Jaffna. This new project has the following components (i) Improvement of Irainamadu Head Works including high lift irrigation (ii) provision of water supply and sanitation in Jaffna Peninsula (iii) Sewerage and (iv) Construction of Assistant General Manager office building, OIC office and Quarters. Readers can compare the work involved under the new project with the work to be done under the RfJ project. Component 1: Improvement of Iranaimadu Headwork including high lift irrigation.